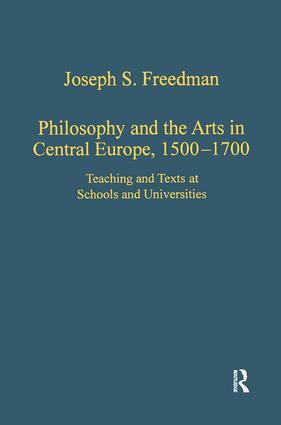 The articles in this collection focus on instruction - and writings arising from that instruction - in philosophy and the arts during the sixteenth and seventeenth centuries with emphasis on Central Europe. The introduction brings together and expands upon many of the topics discussed - and conclusions reached - in the remaining seven articles. Four of these articles are devoted to examining the significance of two ancient authors (Aristotle and Cicero) and of two more recent ones (Petrus Ramus and Bartholomew Keckermann). The article on Keckermann is based in part on previously unpublished biographical and bibliographical source materials. Two concepts - encyclopedia and philosophy - as utilized in the 16th and 17th centuries constitute the subject matter of separate articles. And one article focuses primarily on curriculum plans written during the 16th and early 17th centuries. These eight articles are based on a wide array of printed and manuscript source materials which are cited together with library/archive locations and call numbers and which are made more easily accessible through three indices at the conclusion of this volume. Contents: Introduction: the study of sixteenth- and seventeenth-century writings on academic philosophy: some methodological considerations; Philosophy instruction within the institutional framework of Central European schools and universities during the Reformation era; Cicero in sixteenth- and seventeenth-century rhetoric instruction; The diffusion of the writings of Petrus Ramus in Central Europe, c.1570-c.1630; Aristotle and the content of philosophy instruction at Central European schools and universities during the Reformation era (1500-1650); Encyclopedic philosophical writings in Central Europe during the High and Late Renaissance (c.1500-c.1700); Classifications of philosophy, the sciences, and the arts in sixteenth- and seventeenth-century Europe; The career and writings of Bartholomew Keckermann (d. 1609); Index of academic institutions; Index of authors and persons (pre-AD 1800); Index of concepts/terms and people/places .